Sunday August 9. A small black bear was seen on the Maiden Lake Trail behind Canadian Tire last night. Be prepared and expect to encounter wildlife anytime and keep your garbage indoors between collection days. There is still plenty of natural food for bears in the wilderness, lets not bait them into town with an easy food reward (garbage). Friday August 7, 3 pm. Update. The juvenile black bear followed the runner on R Trail all the way to Ridgemont road. The bear was last seen running towards the Kush trail when the runner stopped a truck and jumped in. In an effort to distract the bear the runner dropped a blue and silver day pack on the side of R trail, close to the wooden bridges. If you find the day pack please turn it into the RCMP. Thank you. There have been no other reported sighing’s of the bear. Friday August 7. A juvenile black bear was reported following a runner for over 20 minutes down Deadfall, to Oh Dear and Old Stumpy trails. There have been other recent reports of this bear in the same area but the bear would always run away when seeing people. In this case the person ran when they saw the bear, which invoked the bears chase instinct. The bear was last seen heading towards the golf course from the bottom of Old Stumpy. The safest bear encounter is one prevented. Wednesday August 5. A grizzly bear was seen by a mountain biker on the power line by Castle Mountain Drive. Be prepared and expect to encounter wildlife anytime. Bears will travel great distances in search of food and will use the path of least resistance, our trail network. Tuesday August 4. A black bear and her cubs were seen on Hedonism Trail by a mountain biker. Make noise to warn wildlife of your presence and avoid surprising them at close range which may provoke defensive behaviour. All our trails are multi use and are becoming noticeably busier with hikers, bikers,dogs and wildlife. Making noise, especially when approaching blind corners and areas where the line of sight is poor will result in a reduction in human/wildlife and trail user conflict. Remember, wildlife and uphill traffic have the right of way. A small black bear was seen on Oh Dear trail yesterday. Make noise to avoid surprising him at close range and leave him an escape route. Thanks to the Fernie Women on Wheels for a great group bike ride andIMG_8210 all the interest in learning about preventing wildlife /human conflict. Glad to hear that you enjoyed the opportunity to practice using bear spray with inert spray of course. A grizzly bear was reported by Whispering Winds mobile home park yesterday afternoon. Tuesday July 28. Mt Proctor trails are reopened. Trails were closed due to cougar activity. 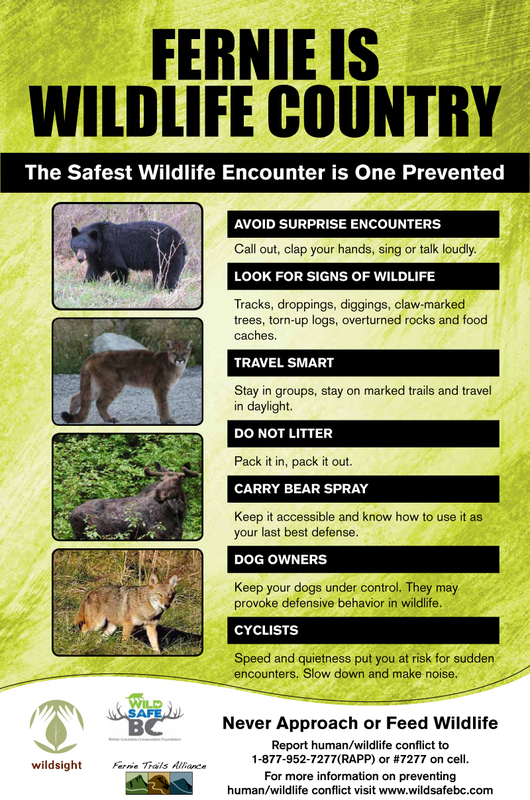 Be prepared and expect to encounter wildlife anytime. Cougars reported following hikers and approaching mountain bikers on Fairy Creek and Swine flu trails in Fernie over the weekend. Trails have been closed until further notice.